With years of living near Barrie Lake, Talon developed a fit swimmers physique. Sandy brown hair and amber eyes help complete his masculine appearance. A seven inch scar wraps his forearm. He could've easily had it healed, but keeps it's a reminder against distraction. A combination of Talon's guarded and protective nature and Ackis' yearning to experience life has created an individual that is watchful of new people but willing to give everyone a chance to prove themselves. Because of this, new chapters in Talon's life have opened. He's more accepting of new friendships and opportunities. Talon is the type of individual that will be there for his friends and family no matter the cost. A friendship with Talon is for life. To earn that friendship is another matter. Time and a true examination of an individual is the only way Talon can accept one as a true friend. Since the Joining, an almost imperceptible smile is on his lips at all times. He is quick witted, intelligent, and by most accounts humorous. With all three, Talon is able to lighten almost any mood with laughter, and be a focal point for his friends. Talon is not quick to anger, but when provoked, his temper is furious. It is not a wild, uncontrolled beast, but rather a calculating one. It has helped him in the past, but it's also been a curse. Talon is most happy when outside. His favorite activities are swimming, Terran soccer, camping, and Seleesh (a Trill sport similar to cricket). With a love of new things, Talon finds happiness and growth in anything that he does. Staying in touch with his sister is one of the most important things to him. With daily letters or when distance permits live conversations, Talon's sister is by far the most important person in his life. Abandoned when he was four and left in the care of the Zelkai Estate, a home for lost children, he felt betrayed, and angry at what his family had done to him. A year at the Estate had turned the normally happy child into an angry bully who attacked without provocation. A rage fueled by abandonment and sadness. What started his turn around was the adoption into the Morel family. Elexa, a single mother of another adopted child, Yazmi, two years older, felt that she had more love to give and knew that she could help Talon. The first years with his new family were rough. Bearing the brunt of Talon's rage they gave him the space when he needed it and love whether he wanted it or not. With time, he realized that they were his family and were what truly mattered. Life in the family became more enjoyable and a rock of support that Talon desperately needed. When he was 17 Elexa fell ill. With Yazmi on her way home from Starfleet Academy, Talon never left her side and waited for his sister to arrive. Both Yazmi and Talon were at Elexa's bedside when she passed. All three holding hands until their mother closed her eyes, and was gone. After the services, Yazmi returned to the Academy, leaving Talon alone on Trill. Despair and a feeling of floating through life was how Talon felt for the few months after his mother's death. Almost on a whim, Talon sold their home and traveled to the main continent to join the Symbiosis school. Talon was one of the youngest ever to gain acceptance. His teachers admired his determination, not realizing it as an escape from the pain of losing his mother. Time passed and the pain of losing his mother diminished but the drive to be joined didn't. A change had come over him. He had direction, he had purpose, and he knew that being joined was what he needed. What he wanted more than anything. After years of training, study, and examination, he was joined with Ackis, a Symbiote that hadn't had a host in 10 years. With any new joining there is an adjustment period for both host and Symbiote. Talon and Ackis were no different. 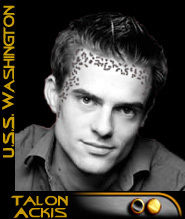 Talon felt Ackis as the neuro-tissues merged. His individual minded consciencness melting into a dual. It wasn't a loss of anything as Talon could describe, but an addition. A growth that he had never, and would never, experience again. Nothing was lost, only gained. With both Talon and Ackis as one, new desires and emotions came into being, and exploring the universe, seeing what was out there was one of them. He entered Starfleet Academy the following term, a year after his sister graduated. His studies focused on Science and Operations, Computer systems and Technologies, with high marks in piloting. Academy life was not what he thought. He was prepared for rigorous studies. He received those. But he felt as if he had gained a new family: the Starfleet Family. With a rich and full past, as with most Symbiotes, Ackis' goal in life is to experience it. To never pass up an opportunity and give both the chance to do things they might not have dreamed of. Varex Ackis - 2181-2212: Varex was Ackis' first host. An honor that is bestowed to the most promising Trill symbiosis students. Varex was a student of mathematics and science on Trill. His life was cut short due to a shuttle accident traveling from the capital to visit friends in the Makesh Province. Stranded for 6 hours, Varex struggled to hold on to life for himself and for Ackis. Varex was found and rushed to a medic but the wounds were too left too long. Ackis was without injury. Kelvena Ackis - 2212-2263: Kelvena Ackis lived a life of politics. Voted to the Trill Senate, and emissary to Earth, Kelvena helped improve the lives millions of Trill. Her actions during the Tholian Crisis are considered one of the greatest acts of diplomacy, helping to prevent a war that could've claimed the lives of thousands. Kelvena died happily, amongst friends and family members. Sareena Ackis - 2263-2321: Sareena was one of Ackis' most cherished lifetimes. One where they could grow, have a family, and spend time with the ones they loved. Illness took Sareena at a fairly young age. Ackis remained unharmed through the illness and was saddened at the loss of Sareena and the family Ackis left behind. Bari Ackis - 2321-2374: A good trader among the Beta and Alpha quadrants, Bari Ackis had seen many wonders and tragedies in their life. It was the sense of freedom that only life on the open space ways could give them. Bari's life ended after an engineering accident. With crew nearby, Ackis was saved. Before his death Ackis requested a 10 year time in the pools before his next host. A request that would be followed. It is unknown as to why Ackis requested the break.